Hey Athletes: Are You at Risk for Tendinitis? ?What increases your risk for tendon problems? Athletes, you want to do whatever you can to avoid being benched, particularly for injuries. When you know you’re at risk for a health problem, you’re able to do more to prevent it. Of course, knowing you’re at risk is the key. Knowing your risks can help you address issues like tendon pain from tendinitis in your lower limbs before it affects your game. Tendinitis is inflammation and irritation in tendon tissue. While this is particularly common in the Achilles, your feet can develop tendon pain in several places, including the peroneal tendons on the outside of your ankles, and the extensor tendons on the tops of your feet. Normally it’s an overuse injury causes by repetitive motions, holding an awkward position for too long, poor conditioning, or faulty biomechanics. Age – The older you are, the less flexible your tendons become. This is especially important for middle-aged “weekend warriors” who play sports or go running for fun and exercise on a regular basis. Training – Overuse from overtraining or improper technique during your sports can take a real toll on your tendons over time. Gear – Worn out shoes don’t support your feet well, and may contribute to tendon strain. 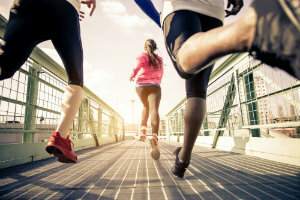 Biomechanics – If you have arch issues or are prone to pronation problems, you could be straining your connective tissues. Knowing your risks for tendinitis allows you to take steps to protect yourself and stay in the game. If you do have a high risk, don’t take your current foot health for granted. Our team at Absolute Foot Care Specialists will help you make sure your tendons stay healthy. Contact our Las Vegas offices online or by calling (702) 839-2010 for more information, or an appointment to take care of your foot health today.